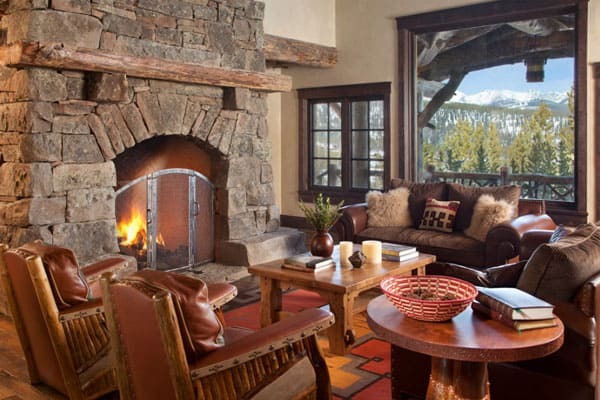 Beautiful, private mountain retreats, with cozy living spaces, plenty of warm colors, and fireplaces are the perfect place to burrow for the winter holidays. 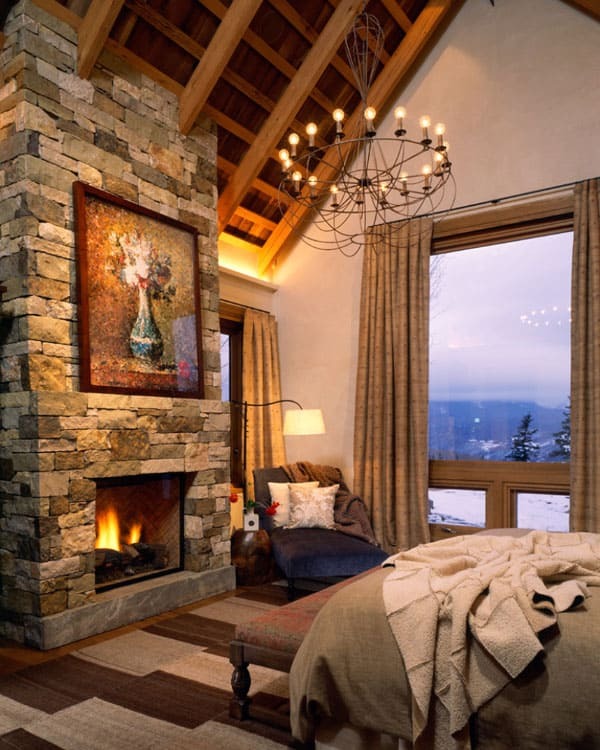 Retreating to one of these cozy spaces, you can plan your whole day completely devoted to reading in front of the fire, curling up with a good book and watching the snow fall through floor-length windows, with a mug of hot cocoa in hand. 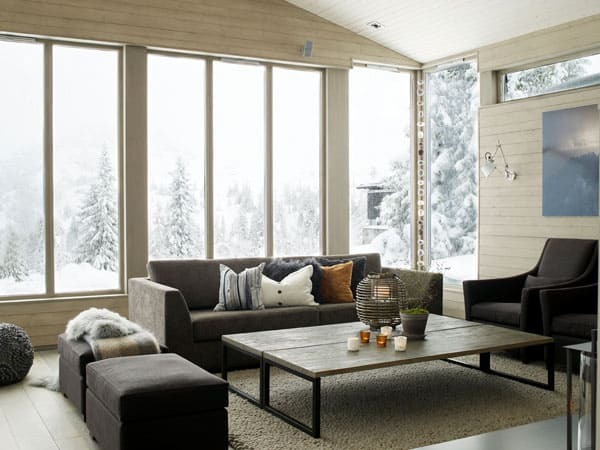 We have put together for you an extensive collection of snowy retreats that will help put you in the mood of Christmas, wherever in the world you live. 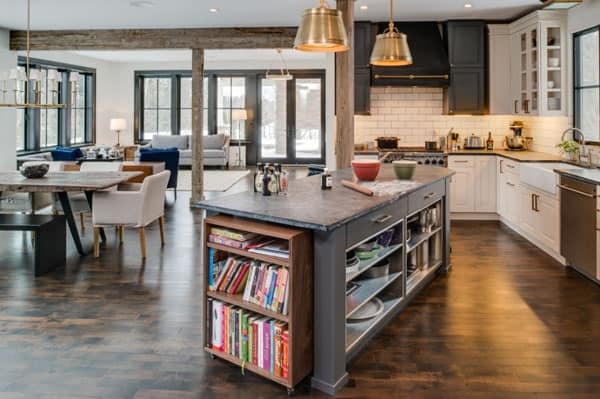 Some of the retreats we have featured have links to view the entire home if you would like further inspiration. 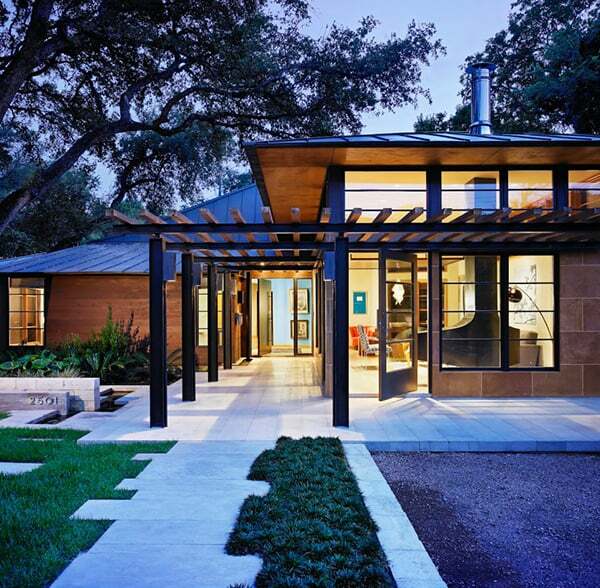 Be prepared to be blown away by these fabulous homes. 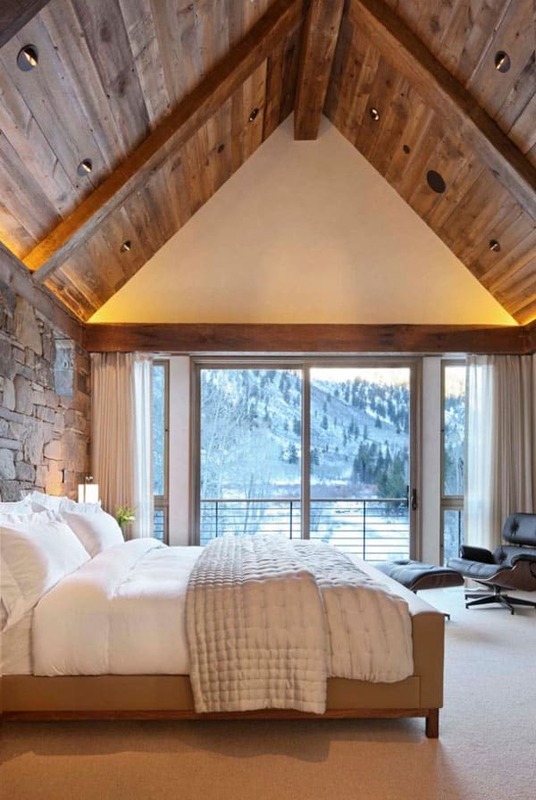 If you prefer burrowing in blankets of chenille to blankets of snow, these contemporary winter getaways boasting sweeping views will be right up your alley! 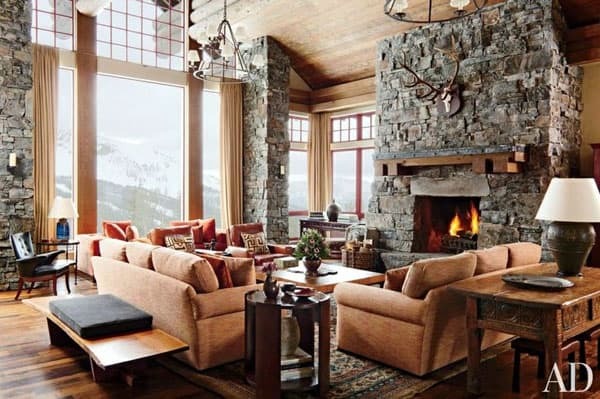 This light-filled living room owned by Estee Lauder’s global creative director, Aerin Lauder, is a fabulous getaway for the winter. 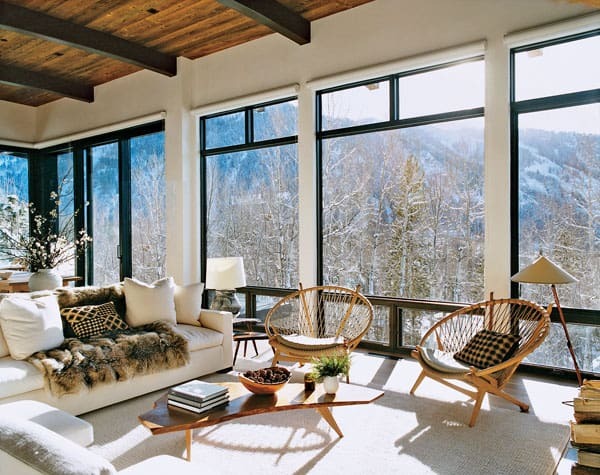 Floor-to-ceiling windows, awesome 60s-inspired rattan chairs, and throws and pillows make the white and natural space warm and personal in Aspen, Colorado. 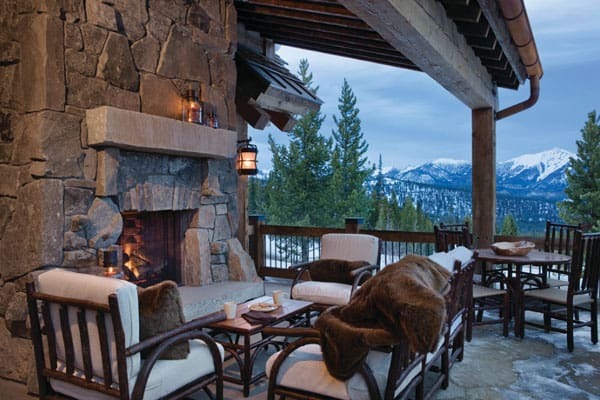 In Montana’s Yellowstone Club, a getaway home showcases the Old West vernacular with an industrial edge. 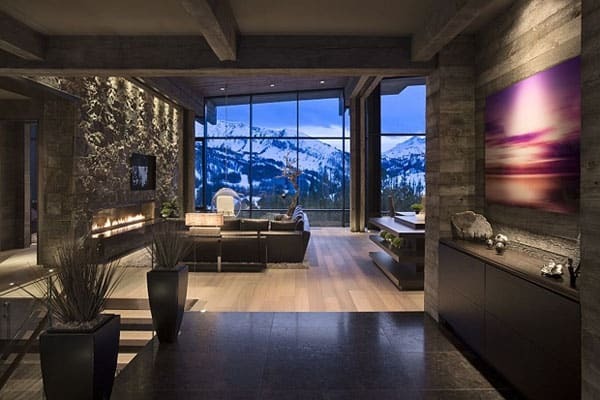 To see more of this spectacular home, check here. 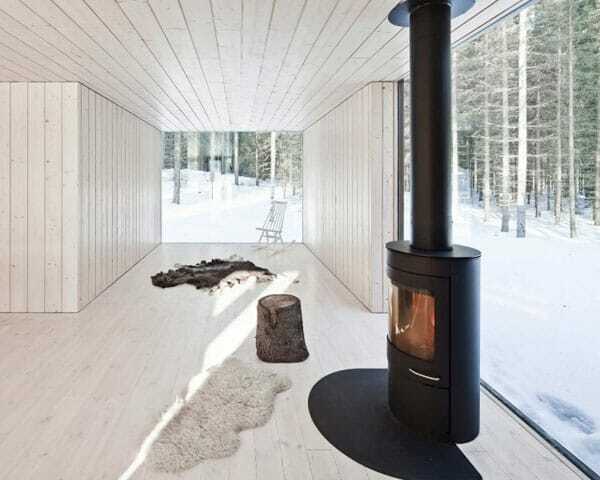 Four-Cornered Villa is an 840 square foot home situated on a horse shoe shaped island in Virrat, Finland. 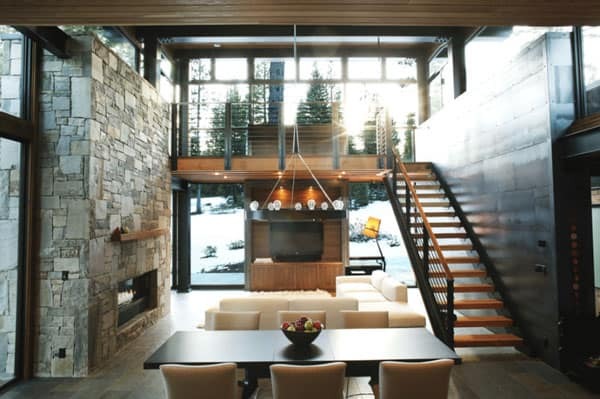 This alpine chalet is a contemporary barnlike structure located on a cul-de-sac in a private ski club development in Collingwood, Ontario, Canada. 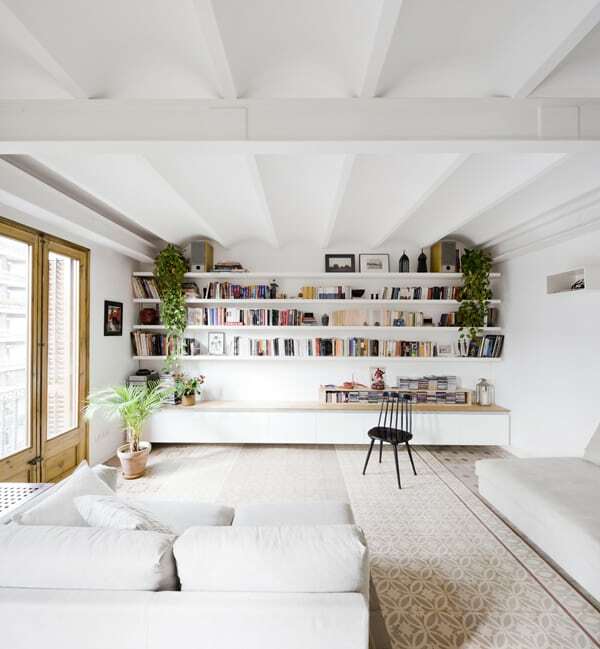 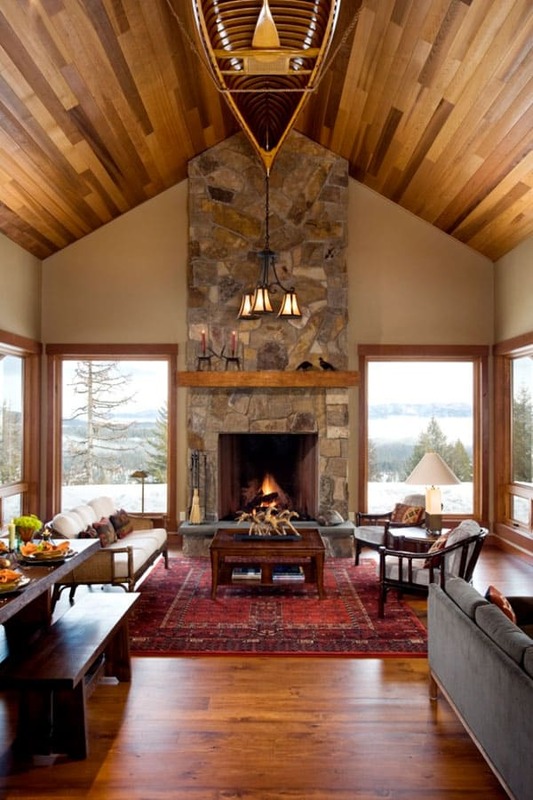 Ceilings that reach for the stars belong in a home with plenty of windows and bring the outdoors in, sans the uncomfortable cold and wet aftermath of actually being outdoors. 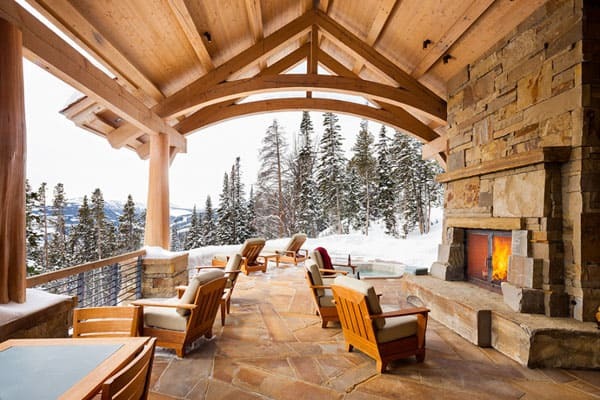 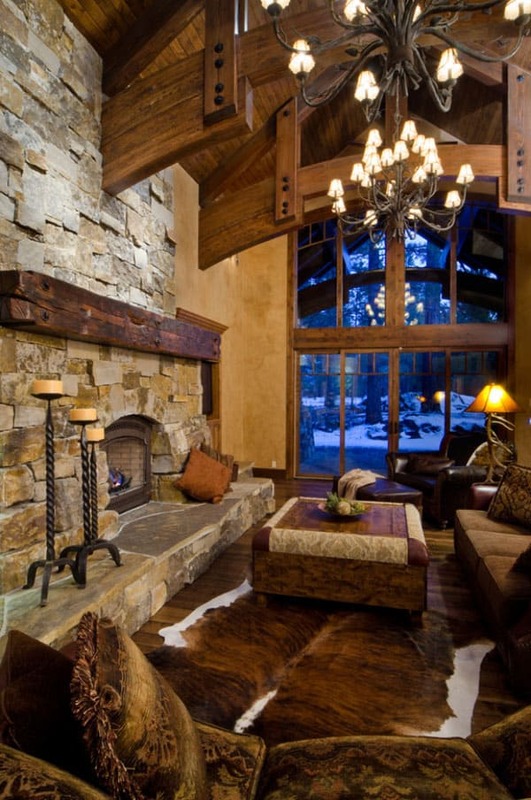 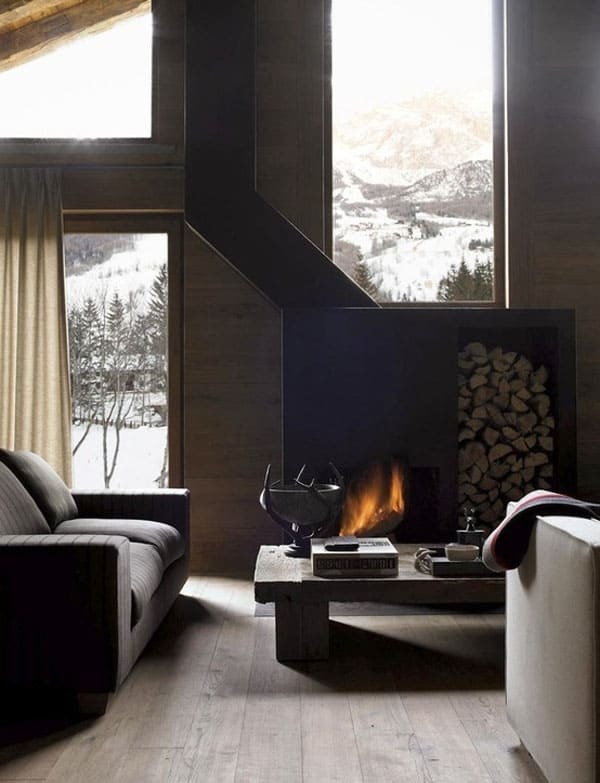 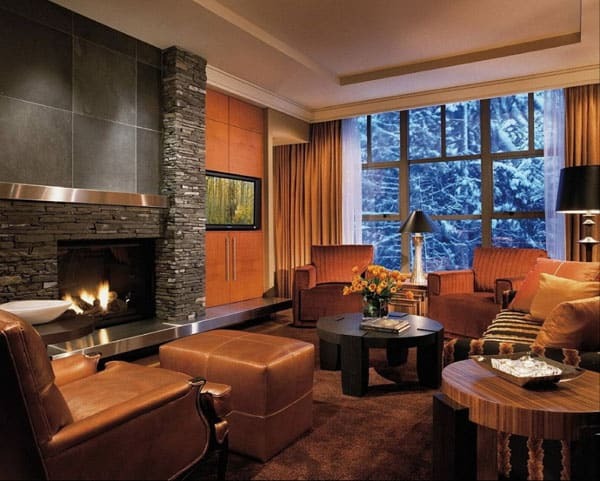 A cantilevered fireplace is the showstopper here, keeping you warm when you do head home after a day on the slopes. 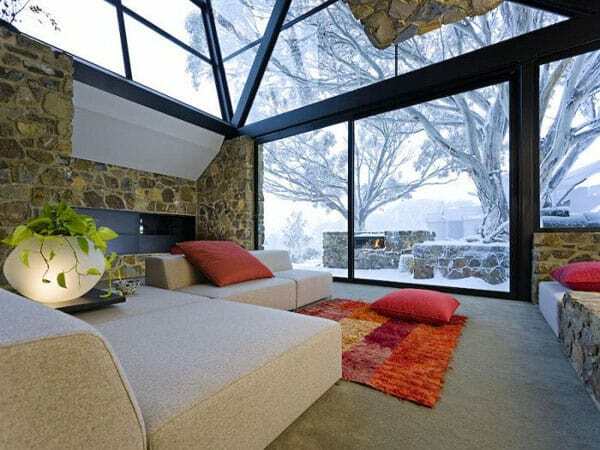 Nottawasaga Bay in Ontario, Canada looks like a fine place to cozy up with a book. 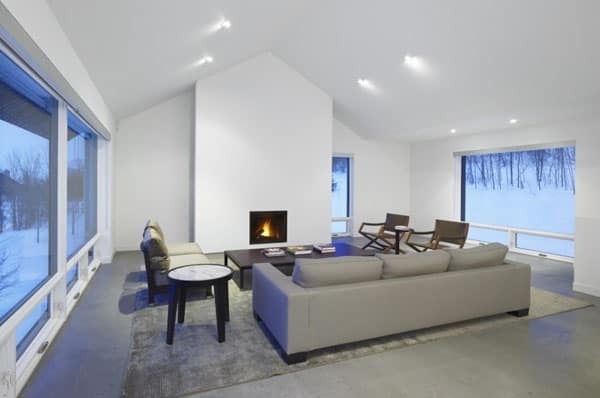 A stark contrast to the black exterior, the snow-white interior boasts a minimalist, frameless fireplace, and an assortment of furniture with ultra-sleek lines. 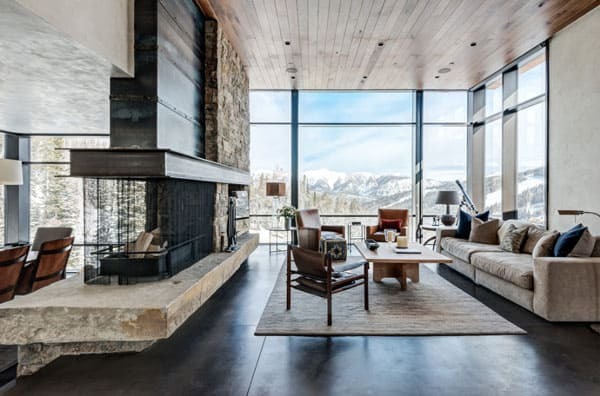 This super stunning concrete mountain retreat captures snowy views at every turn in Snowmass, Colorado. 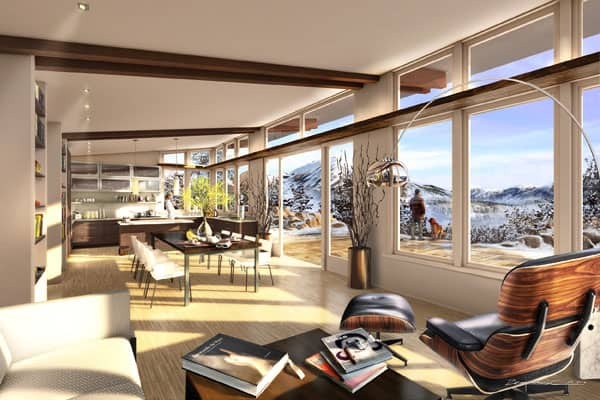 The rest of the home can be viewed here. 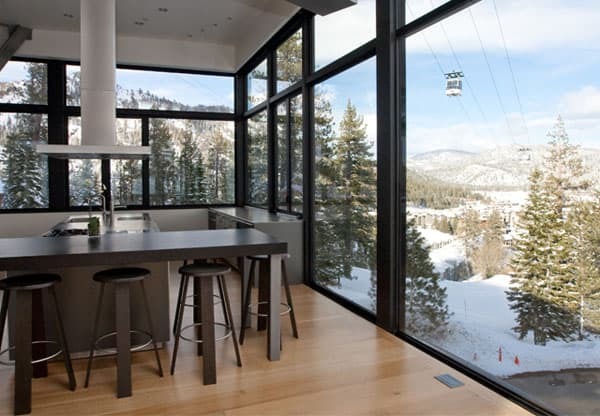 Enjoying mountain views throughout this home in the old village of Sugar Bowl in Norden, California, the windows frame views of horizontal snow drifts and vertical stands of pine trees. 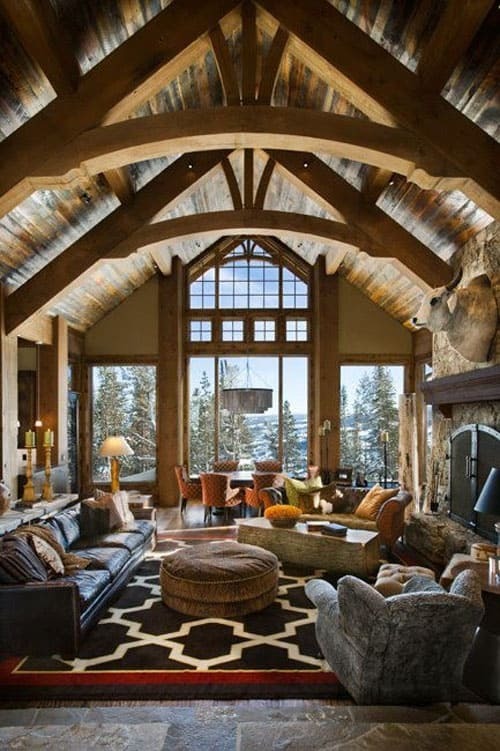 To see more of this stunning home, have a look here. 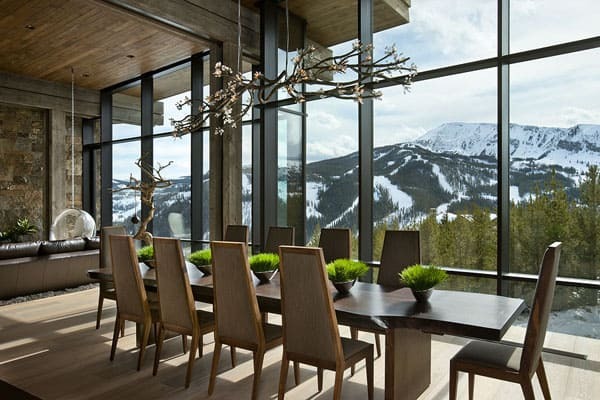 This contemporary Lower Foxtail Residence hovers in the pines stretching laterally to take full advantage of the bold mountain views in Big Sky, Montana. 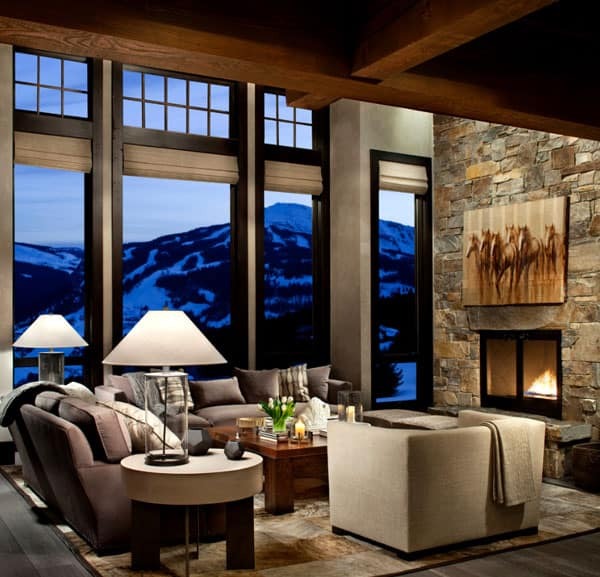 At 15,000 square feet, this contemporary mountain home in Aspen, Colorado’s exclusive Star Mesa enclave is warm and approachable from the start, as can be seen here. 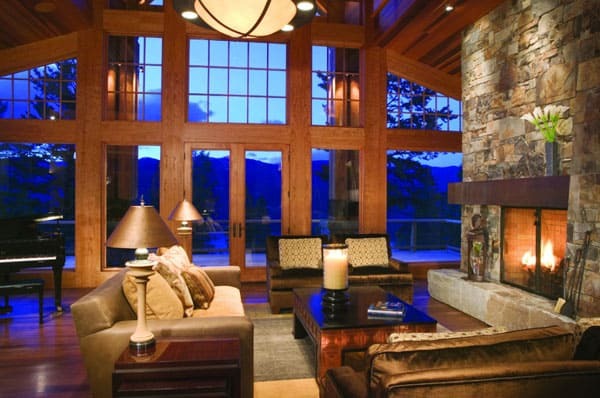 This gorgeous modern mountain home is set amongst the woods in Martis Camp, North Lake Tahoe. 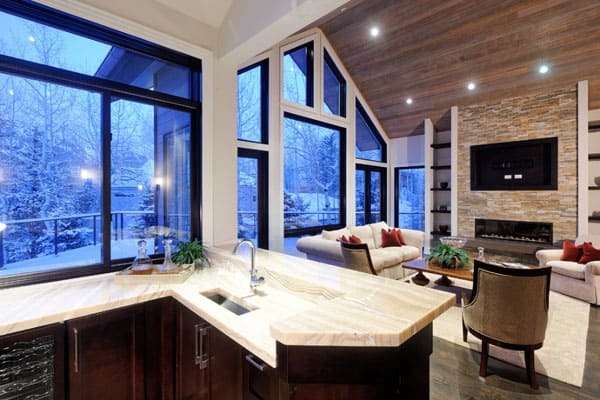 The rest of the home can be viewed here. 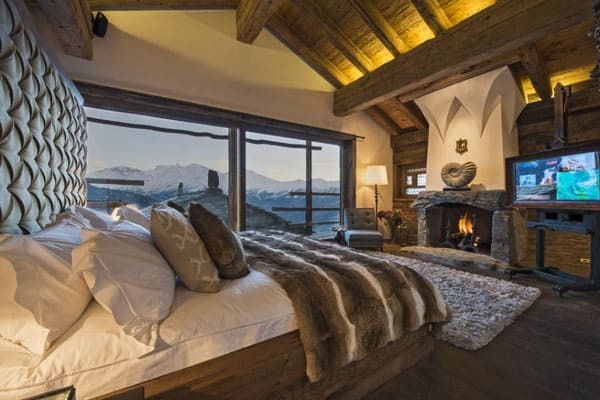 Nestled into the mountainside, with spectacular views of the resort and surrounding scenery, Chalet Trois Couronnes is a private Alpine Estate in Verbier, Swiss Alps, Switzerland. 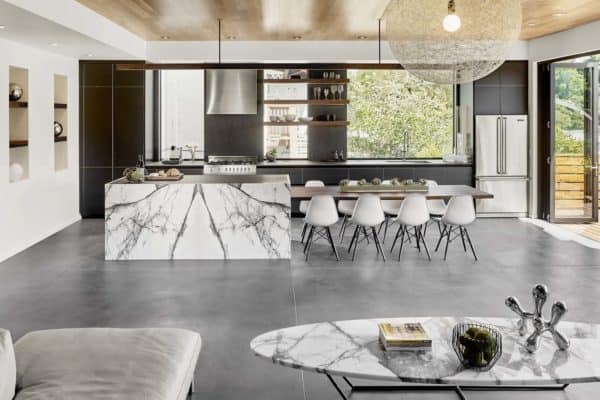 This snowy retreat was constructed of steel, concrete, timber and locally quarried stone, built within the scenic Australian mountains in one of Victoria’s premier ski resorts, the Dinner Plain Village, overlooking Mount Hotham. 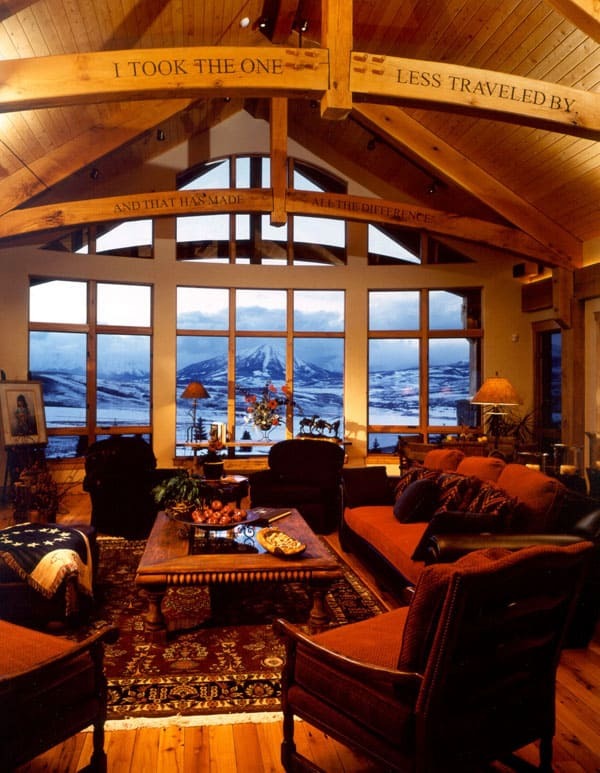 “Ski On Home” is a single-family home built for a young family of four avid skiers and snowboarders (mom and dad are also both world-class skydivers). 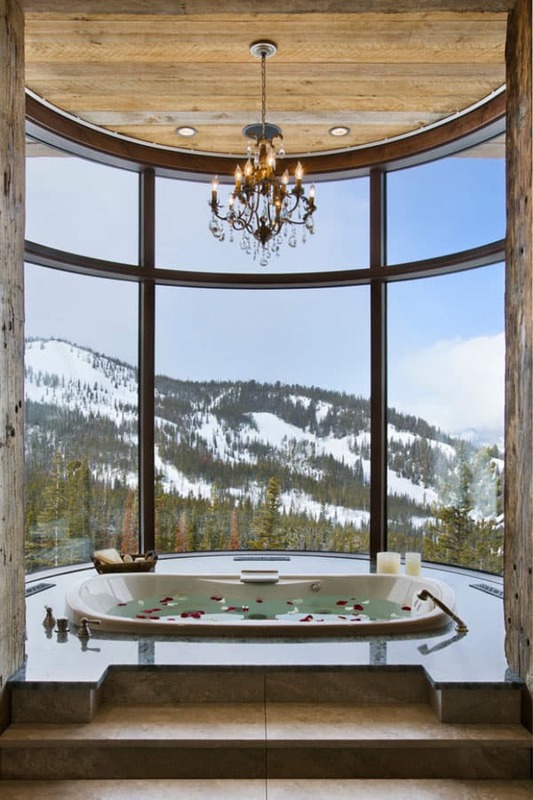 It is located on the main ski run in Squaw Valley, CA and nestled into the mountain, naturally protected by the earth from avalanches and other extreme weather. 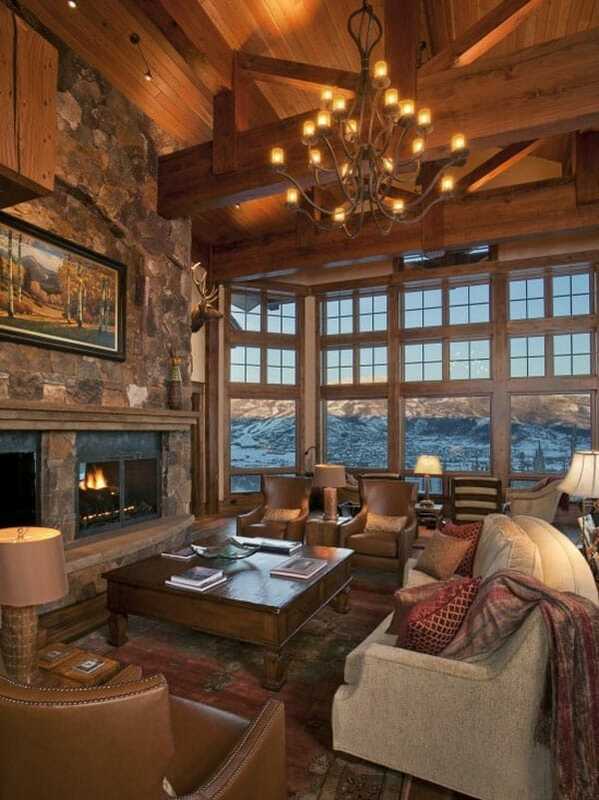 The year-round residence has ski-in / ski-out access on all levels and sleeps up to 17 guests at a time (extended family and a constellation of friends). 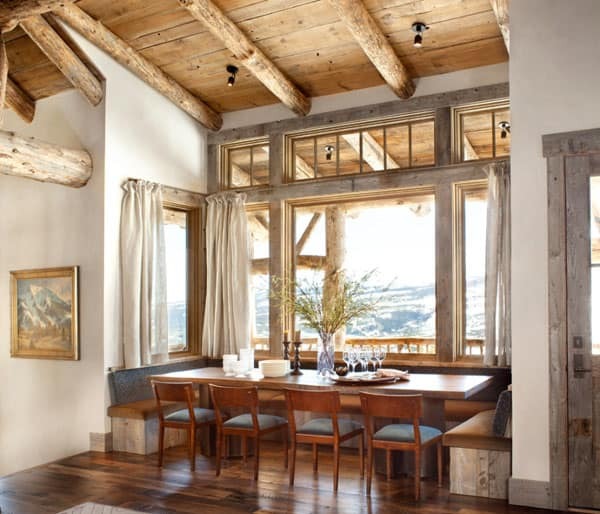 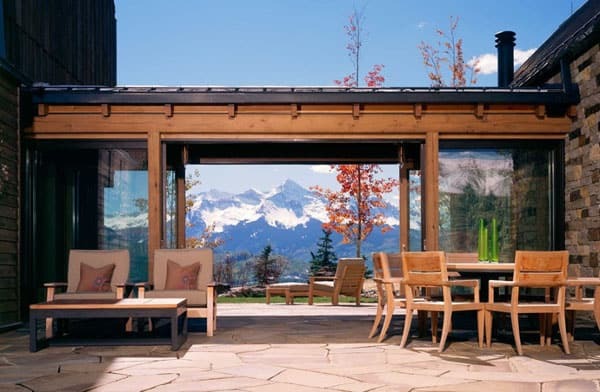 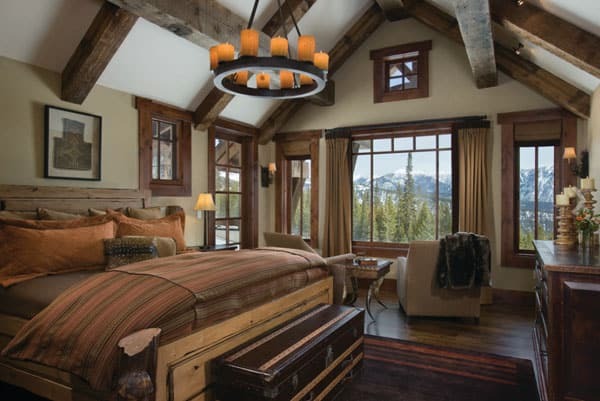 This incredibly stunning modern rustic mountain retreat was built as a family compound in Telluride, Colorado, which can be viewed here. 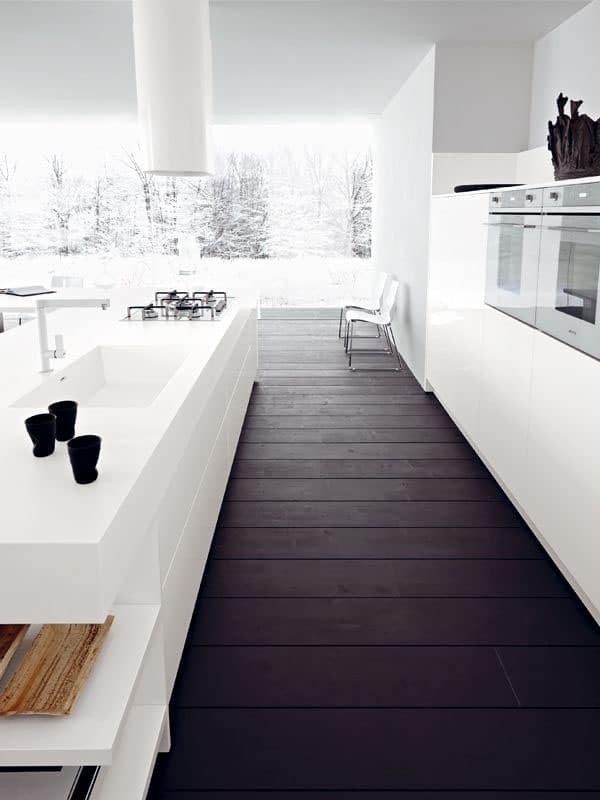 When you have a kitchen like this, bake up a storm for your friends that come to visit you during the holidays. 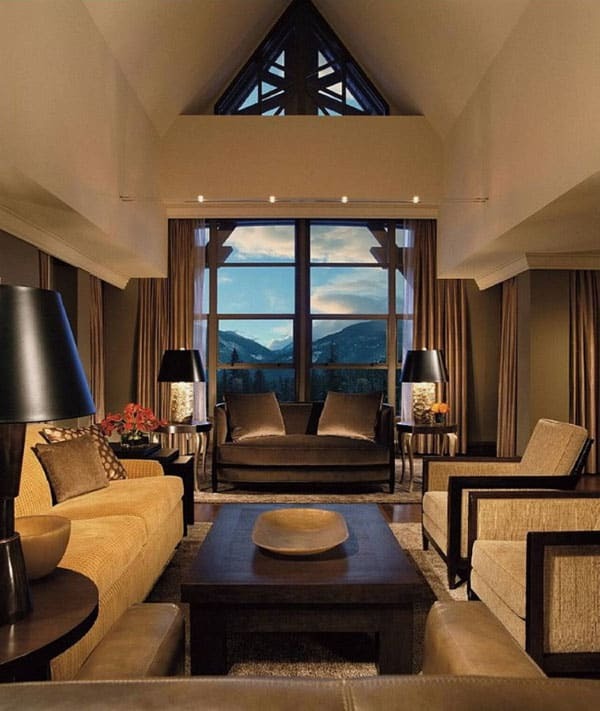 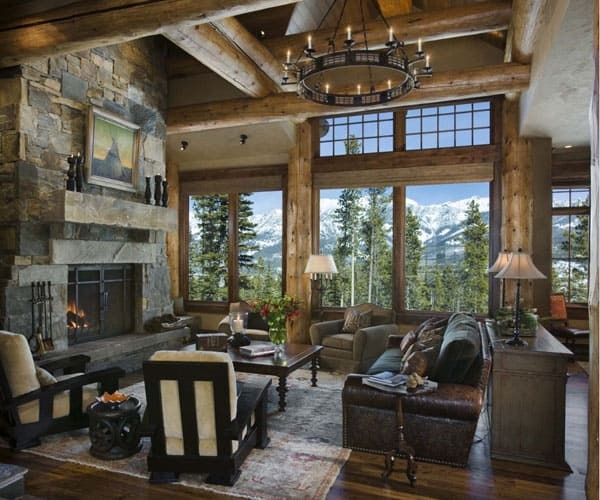 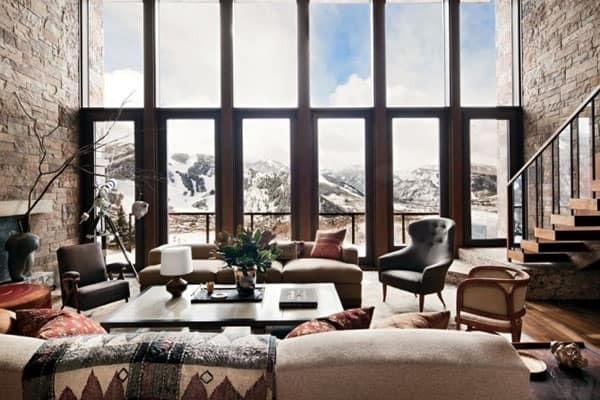 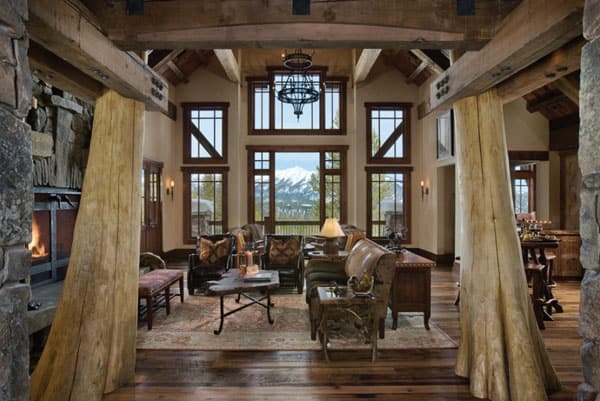 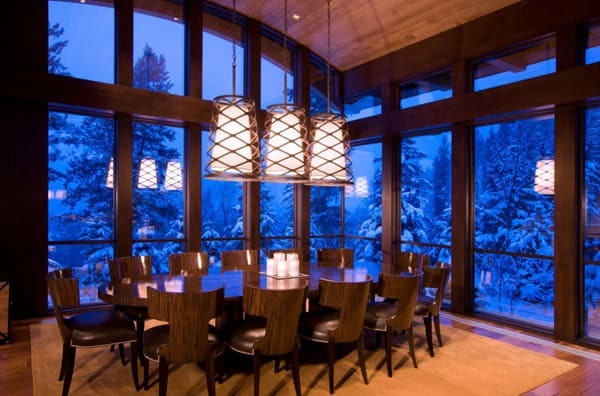 The huge floor-to-ceiling window will make you feel like you are in the great snowy outdoors sans the cold weather.